Old Navy partnered with NBC.com for their 3rd annual Thanksgiving week Gooblepalooza campaign where their 3D glasses wearing turkey would promote ‘eye-popping’ deals. We pitted him against the NBC Peacock for a fashionable face off of sorts — utilizing New York City backdrops and Old Navy clothes. 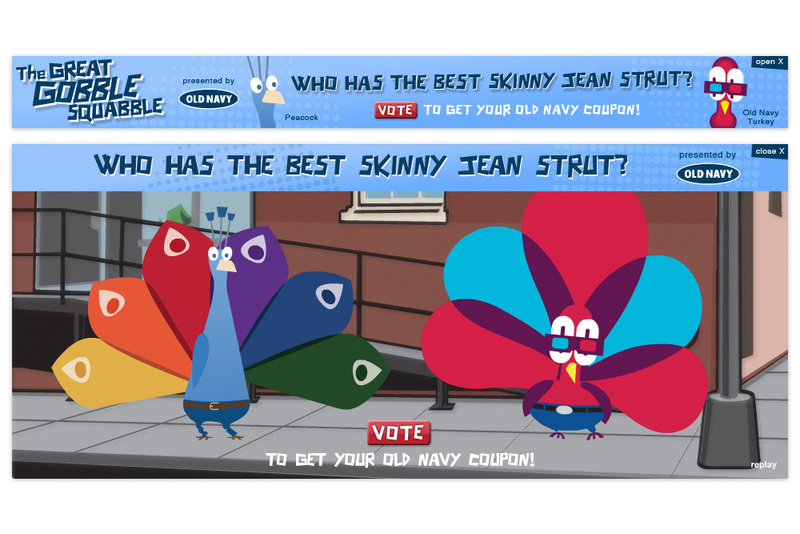 The result was a 4 day campaign leading up to — and on — Black Friday where we directed nbc.com visitors to a custom branded page where they could vote for their favorite and get an Old Navy coupon. I worked with the marketing department to help conceive and cowrite the campaign and then directed, illustrated and designed it — working with talented motion artist Thierno Diallo on the animation.